• IT’S OFFICIAL! 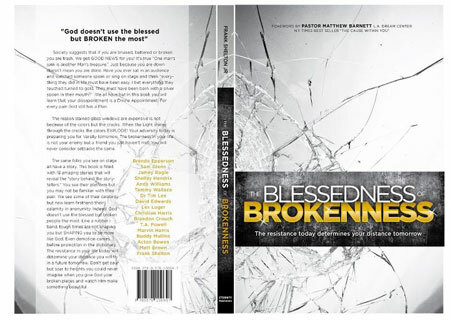 Our new book “THE BLESSEDNESS OF BROKENNESS” is released and available for sale! It has been a labor of love and 87,400 words, 210 pages later it is ready to be read. Pastor Matthew Barnett of L.A. Dream Center, Dr Junior Hill & Zoro, (Lenny Kravitz) international drummer graciously wrote the foreword.• Have you ever sat in an audience and thought “I bet that singer or speaker has led an easy life? Everything they touched must have turned to gold or born with a “silver spoon” in their mouth? The fact is, the folks that I admire most have endured the most. In 1992, I preached a sermon called “The Blessedness of Brokenness.” God gave me both the title and text and I have come to the conclusion that God doesn’t use the “blessed” but broken the most. What religion says is a “dead end” God uses as a launching pad to victorious living and notes “I’ve just begun.” Mark Lowry was right that “God tends to use broken pots because they leak more water.” An anointing oozes out of broken vessels because the cracks reveal Christ’s grace, mercy and love. $16.99 includes shipping handling within the United States. Glean from former Gaither Vocal Band singer Buddy Mullins as he writes about “Performance to Peace” and be inspired by Acton Bowen in the words of “USHER” who called him “Pastor to the stars” as he shares “Grief to The Grammy’s.” World Wrestling Champ Lex Luger graduated from “The Total Package” to complete package after “The King of Ring met The King of ALL Kings.” Think E founder Matt Brown paints a poignant picture that our dreams are overrated if God is not the author of them and Dr T.A. Powell, pastor and online professor at Liberty University will bless you big time! Be inspired by Sam Glenn, former TEEN MANIA’s “Acquire the Fire” speaker share “The Gift of Failure.” Learn firsthand about life after death of Tammy Wallace (member of FBC Woodstock) who lost her beloved husband, Creig to cancer and my personal pastor, Rev Marvin Harris whom lost not one, two, or three but FOUR children under the age of two to die from a congenital heart disease. Marvin was “lost” without Christ but received salvation after his children’s death and for the last 25 years in ministry! Romans 8:28 is still in the Book! Glean from Shelley Hendrix, founder of Church4Chicks and fellow Fox News contributor & Jamey Ragle’s “Beyond Brokenness” will minister to you profoundly. Grandson to the world-wide ministry of Trinity Broadcast Network, Brandon Crouch shares “Hollywood to the Holy Land” and many others! This book reveals tragedy to triumph becoming trophies of God’s grace while proclaiming the Gospel Truth. The book had been brewing in me for exactly two decades but God finally gave me the green light to release it. Our prayer is that this book will bless you and help you view brokenness in a different light. In the words of my buddy, Mark Shelton: “I met God on the mountain but the Lord in the valley.” Indeed, God is a present help to the broken heart. It is medically proven that a bone becomes stronger after a break. Andy Stanley is right when he notes: “God may showcase His strength on the platform of your weakness.” God never wastes a trial and where man discards the Messiah delivers. When Jesus fed five thousand, He took the bread and broke it after giving thanks. The irony is that lad’s lunch in the Lord’s hands after being broken enabled him to be part of God’s ministry to witness Him firsthand feed the masses. Jesus then instructed the disciples “gather the fragments that nothing be left.” After finding a feasting in fasting I now realize that the LORD LOVES LEFTOVERS and relishes in resurrections. Only God enables imperfect people to promote His perfect Son! What man throws away God sees as a treasure and He uses our brokenness to draw us closer to Him and gives us a greater reach to minister to others. Grab your copy TODAY!